RAAS Professional (Runway Awareness and Advisory System) models the aural 'Smart Landing' and 'Smart Runway' calls included in the real-world Honeywell RAAS unit. These calls offer improved situational awareness for pilots in an effort to help reduce the risk of runway incursions and accidents by providing aural alerts during taxi, takeoff, final approach and landing/roll-out operations. 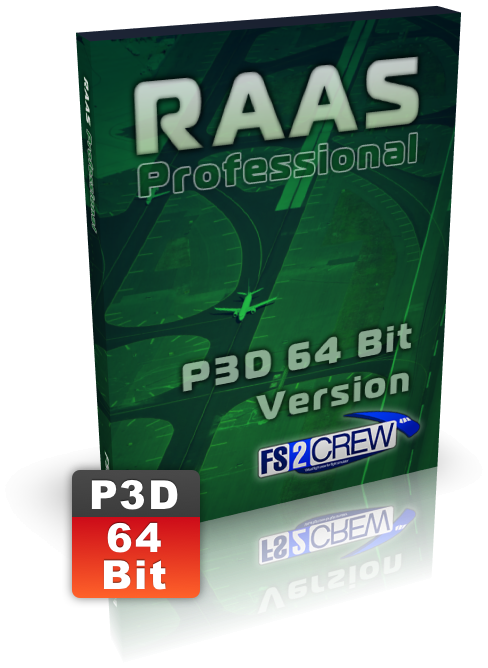 This version of RAAS Professional supports PREPAR 3D VERSION 4 (64 BIT) only! The software is professional grade, highly configurable, and is ideal for power users who want to model airline-specific options and who want maximum control over how RAAS functions in flight simulator. What makes RAAS Professional unique - it's in the Details! Our version is the most sophisticated, feature-rich and technically accurate RAAS simulation on the market. We studied the Honeywell RAAS manuals down to every last detail, and modeled every system with an eye toward achieving ultimate technical accuracy. Built directly into the simulation with no need to launch an external application. Works with all aircraft in your hangar. Powerful user options give you complete control over RAAS, and allow for complete customization to match you or your Virtual Airline's specific needs. Create aircraft specific RAAS Profiles and easily link them to specific flight simulator models via our powerful Graphical User Interface. Export and Share your custom RAAS Profiles (Airline Equipment options and Settings) with the flight simulator community.